Founded in 1898, by Captain William Burke Vane and his brother Allen P. Vane. The two were natives of Maryland, they traveled to Baltimore, Maryland. Where they established a ship chandlery operation. In 1910, the Vane Brother's chandlery was established at Fells Point in Baltimore, Maryland. It developed into a "one stop"
for supplies and services for sailing vessels in the Port of Baltimore. The company eventually moved to a larger headquarters on East Pratt Street. This location was located across the street from Pier 4 in the Inner Harbor. In 1917, the company acquired the J.S. Beacham and Brothers shipyard in Federal Hill, Maryland. A partnership formed with J. Carroll Redman. Resulting in the founding of the Redman-Vane Shipyard. In 1920, Captain William Burke Vane sold half of his ownership to a cousin by the name of Claude Venable Hughes and his brother Charles Fletcher Hughes. Claude Venable Hughes joined the firm. In 1921, his brother Charles Fletcher Hughes to join the firm as well. In 1923, Hughes acquired a share in a two masted schooner named the John R.P. Moore. The "Picket Boats" would tie up at Pier 4 where the Company supplied them. However, the Redman-Vane shipyard was condemned in 1942, to make room for the expansion of the Bethlehem Steel plant. Later that year Diesel engines begin to dominate the market. And with the advent of the diesel engine, Tugs, barges, tankers and Ships become the bulk company's business. The sailing vessels that Vane Brothers once served were becoming obsolete. In 1951, Charles F. Hughes Jr. joined the company. In 1957, the company shifted out of the inner harbor to a new location at South Broadway. The new location featured a pier alongside it. Making the vessels served directly accessible. In 1971, with an expanding bunker market. The company commissioned the construction of a 42,000 bbl tanker. Fueling ships in Baltimore Harbor. Upon its completion, the new tanker is christened the Duff. In 1972, Charles Hughes Jr. would become president of the Vane Brothers Company. Later that year, Captain Russi Makujina is marooned in Baltimore due to a longshoreman's strike. That Makujina's family immigrates to the United States under the sponsorship of the Hughes family. And Makujina then joined the company. In 1979, the company designed and commission and the construction of a 10,000 bbl tanker, the Anne. In 1985, Vane Line Fuel is established. Although in 1986, Vane Brothers acquired the Marine Launch Company of Baltimore, Maryland. Marine Launch held the local delivery of Marine Lubricants. And with the acquisition, came two vessels the Willkate and Carlyn. In 1987, the company shifted to Pier 11, which was located in lower Canton. The location featured 3,600(ft) of deep water berthing as well as 160,000 square feet of warehouse space. All on thirteen acres of land. That same year, the company acquired their first 15,000 bbl double hulled barge. In 1990, the company commissioned the construction of the Elizabeth Anne. With the construction of the company's own tug it reduced the need to hire outside tugs to move equipment. During this expansion the company also began to expand into the Philadelphia, Pennsylvania market. They acquired Piney Point Transportation of Chesapeake, Maryland. And in 1992, the company acquired assets from Allied Towing of Norfolk, Virgina. Vane Brothers later established additional operations in Norfolk, Virginia. In 1998, the company celebrated one hundred years of business, and in 2001 the company began construction of a new headquarters at Farifield in Baltimore, Maryland. In 2004, Vane Brothers commissioned and christend the Patapsco and the barge Double Skin 55. Later that same year Vane took delivery of the Double Skin 51 and 52. In 2007, the company took delivery of their first Articulated Tug and Barge (ATB) the Brandywine and her 140,000 bbl barge, the Double Skin 141. Later that year Vane took delivery of a second ATB the Christiana and her barge, the Double Skin 143. 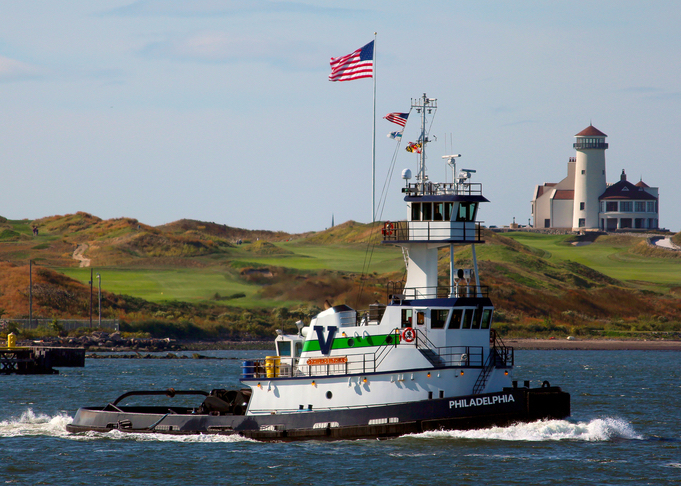 In 2008, the Vane Brothers company christened the first of a series of 3,000 horsepower Sassafras Class tugs. With the expansion of their fleet. The company broke their existing and emerging fleets into four classes: ATB, Patapsco, Sassafras, and Legacy Classes. In 2010, the Vane Brothers Company established a fleet in New York Harbor in New York, New York. In 2013, the company acquired Chatham-Colonial Towing Company of Savannah, Georgia. Which expanded the Vane Brothers Company's operating areas to include Charleston, South Carolina; Jacksonville, Florida; and Savannah, Georgia. And, added ten vessels to the company's fleet. In 2013, Vane Brothers acquired the River Associates Company of Philadelphia, Pennsylvania. A subsidy of the Kirby Corporation of Channelview, Texas. This acquisition added six vessels to Vane's fleet. In 2015, Vane Brothers began construction on the first of a series of heated asphalt barges. Signaling the further diversification of the company's client base. In 2016, the company christened another new series of towing vessels with Elizabeth Anne Class. Constructed by St. John's Shipbuilding of Palatka, Florida. The diversification also included the construction of three additional Articulated Tug and Barge Units, with 80,000(bbl) barges. To be built by Conrad Shipyards of Texas between 2016 and 2018. The Vane Brothers Company maintains operations in Baltimore, Maryland; Philadelphia, Pennsylvania; Norfolk, Virginia, Charleston, South Carolina and New York, New York. The company serves the East Coast and Gulf Coast, as well as Puerto Rico and the Great Lakes.